I’ve made these twice recently for different BBQs and they go down a treat with adults and children alike. They are so easy to make. It would be a great recipe to get the kids involved with and take dibs on who likes the bowl. I don’t have any photos yet but you can rest assured that anything with chocolate, butter and mars bars is going to taste good. This recipe makes two tins of 21 x 21 cm size, about 18 portions. It comes from the Avoca Cafe Cookbook 2. The Avoca cafes are my heaven, I love the stores, the food and all of it’s home-wares. Worth a visit, if you are a foodie. The best ones are Powerscourt Gardens and Rathcoole in Ireland. Cut the Mars Bars and butter into small chunks. Add them into a heated saucepan (medium heat). Melt the butter and Mars Bars. Fill a saucepan 3/4 full of water. Place a large bowl over the saucepan and turn on the heat to medium. Add the chocolate and let it melt. Stir occasionally. Mix the melted butter and Mars Bar mixture with the Rice Krispies in a large bowl. Spread the mixture into the tin you plan to use, leveling it out. Once the chocolate is melted, pour over the chocolate and spread it evenly. Leave to set in the fridge or at room temperature if it’s cool enough. When you are ready to eat, turn the mixture out on a board and cut into squares. This is take on Donna Hay’s Red Curry Pork Pies from her Season’s Cookbook. I was looking for a nice recipe for a picnic in the lovely Roma Street Parklands in Brisbane. Donna’s recipe uses pork; I swapped it out for chicken thigh meat and I’ve added some veggies to bulk them up. I told my partner that I was making pies, I think he was slightly disappointed when he realised that they weren’t steak and kidney. He was won over when he actually tasted them. They are banging with flavour and just that little bit different. Utensils: You’ll need 2 round pastry cutters, 1 slightly smaller than the other for the top and the bottom of the pies. A metal pastry muffin tin. I had neither of these so I had to improvise. They were a bit rugged looking but the flavour certainly wasn’t compromised. Oil spray for greasing the pastry tin. Heat a large saucepan over a high heat. Add 1 tablespoon of the oil and onion and cook for 2 minutes. Add in the peppers and fry for a further 5 minutes until they are starting to become soft. Remove the vegetables from the saucepan and set aside temporarily while you brown the meat. Add the remaining oil to the pan, allow to heat and then add the meat and cook until brown. Stir in the curry paste and cook off for a minute or 2. Re-add the veggies. Add the coconut milk, the coconut cream and the stock to the saucepan and bring to a simmer. Cook for about 20 minutes until the sauce has thickened. You don’t want it to be too runny or you’ll get a soggy bottom for your pies and no one likes a soggy bottom. Set the sauce aside while you prepare your pastry. Cut out 12 of the larger pastry rounds and 12 of the smaller pastry rounds. You can get artistic or get the kids involved and make some leaves for the top of the pies with the leftover pastry. Grease the pastry tin. Line the holes with the larger pastry rounds. Spoon in the filling. Don’t overfill or the sauce will ooze out while baking. With a pastry brush, brush the egg around the edges of the pastry round. Add on the top pastry round and brush with the remaining egg. Place in the oven and bake for 30 mins or until golden brown on top. These are good eaten hot or cold. I just had a thought, they’d be delishuss with a mango chutney. Pasta is my comfort food. This recipe is so simple and so satisfying. It’s from the Matt Preston Fast, Fresh and Unbelievably Delicious cookbook. It’s a great cookbook, it’s one of the cookbooks that I cook from the most. Lots of no fuss recipes and so many left that I want to try. I’ve tried many methods for cooking a poached egg with varying degrees of success. My method is below but I’ve also given you Matt’s as well. The choice is yours. Cook the spaghetti as per the packet instructions with salted water. Drain once cooked. Add some olive oil to a heated pan and fry the bacon until nice and crispy. For best results, do one egg at a time. Fill a deep pan with some salted water to a rapid boil. Crack an egg in a ramekin. Once the water has come to a rapid boil, reduce to a simmer. Make a whirlpool in the water and slowly drop the egg into the whirlpool. The egg will take about 2 minutes to poached. Remove with a slatted spoon and place on kitchen paper until ready to use. Take a saucepan filled with boiling water, lightly salted. Create a whirlpool in the water with a wooden spoon. When the water is swirling, gently lower one egg at a time to the centre of the swirl. Turn off the heat and leave to sit for 3-4 minutes. Drain. Toss the pasta into the pan with the bacon and add half the parmesan, stir through. Tong the pasta into a mound on each of the four plates, making a shallow well on the top. Lower the egg into the pasta well and grate loads of parmesan over each mound. Season with salt and plenty of cracked pepper. Sprinkle over the crispy bacon. Repeat for each of the plates. Yesterday was a bit dull and dreary, perfect weather for a Sunday roast. After sifting through my bookcase of cookbooks, I decided on beef brisket. It was a choice between a more traditional southern style brisket from Gordon Ramsey recipe or a Jamie Oliver one. I asked the taste tester which he’d prefer and he gravitated towards the Jamie Oliver Mothership Sunday Roast Brisket one. I was a little intimated by the fact that there are Yorkshire Puddings to be made but I’d said I’d give it a shot. A couple of things to call out, give the meat a good seasoning. I mixed an Oxo cube with the mustard and smothered the meat with it and I still felt it was slightly under seasoned. I’d go a bit easier on the blackcurrant jam as the gravy was a bit sweet for my liking. I also added a stock cube into the water for the gravy. It’s a really satisfying plate of food and we have plenty of leftovers for all the other great recipes from the Jamie Oliver book (Save with Jamie). Pre-heat the oven to 170 degrees Celsius/325 degrees Fahrenheit/ gas mark 3. Season the brisket with salt and pepper and brown in the pan. While the meat is browning, slice the onions. Once all the meat is fried off, remove and set aside. Fry off the onions until brown in the frying pan. Add to the bottom of a casserole dish. (You can do all this directly in the casserole dish if you have gas, I only have induction). Rub the meat with the mustard and Oxo cube and rosemary leaves. Add to the casserole dish. Protect the meat with a sheet of wetted greaseproof paper. This keeps the meat moist and keeps in the juices. Cover with 2 sheets of tin foil and place in the oven. I like my brisket shredded, so I left it on for 5 hours. If you prefer to carve it, 4 hours will do. Check it half way to make sure there’s another moisture; if not, add a little water. While the meat is cooking away, peel the potatoes, halving any larger ones. The original recipe says to parboil in salted water for 12 minutes. I chucked them in microwave for 6 minutes. Press the potatoes down with a masher gently until the split a little. Shake in some olive oil and plenty of salt. Potatoes love salt. Place in the oven an 1 1/2 before the end of the brisket cooking time. Peel and chop the carrots and swede or parsnips. Cook in salted boiling water for 20 minutes or until soft. Drain and mash with the butter. Season with salt and pepper and keep warm. Remove the potatoes and brisket from the oven and pour out some of the meat juices into a jug. Keep the meat and potatoes warm. Up the oven temperature to 250 degrees Celsius, 495 degrees Fahrenheit, gas mark 8. Heat a frying pan and add the flour, jam, vinegar, stock and resting juices. Similar until you have a nice smooth consistency. Keep it on a low heat until you are ready to use. Grab a 12 hole shallow hole bun tray and add some olive oil to each hole. Don’t go too crazy as the Yorkshire puddings will end up being greasy and soggy. Place the tray in the oven while you make your pudding mixture. Put the flour and salt and the eggs in a jug and whisk. Slowly add in the milk and whisk until you have a smooth consistency that’s not lumpy. Carefully take the tray from the oven, it’s hotter than hell. Make sure you have somewhere heat proof to place the tray. Fill each hole 3/4 way full and place them in the oven. Bake them in the oven until they have puffed up and are golden brown, roughly 10 minutes. Carve or pull apart the brisket and serve with all the accompaniments. 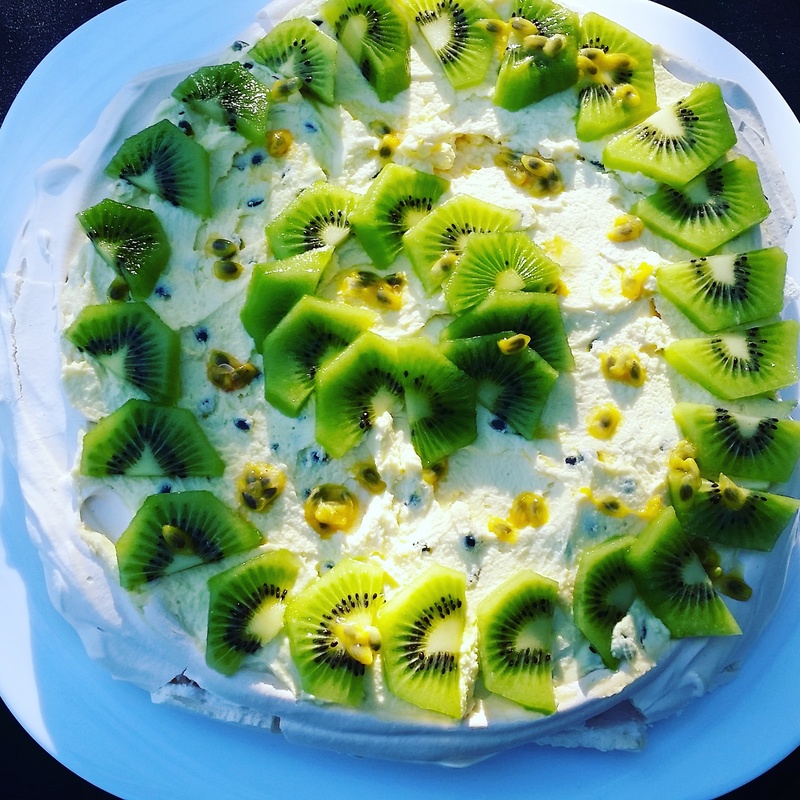 I’ve attempted making pavlova in the past with lots of failure. I found this recipe in the Taste magazine. It’s one of Matt Preston’s. His recipes are always straight forward and tasty so I thought I’d give it a try. It’s pretty fool proof. I’ve tried it twice now and it’s worked both times. I’ve altered the topping recipe but the base ingredients are the same. You can add whatever soft fruit you like. It’s best to make the pav the night before. Preheat the oven to 150 degrees Celsius, 130 degrees Celsius for fan assisted. Draw a 22cm circle on a sheet of baking paper. Place the paper on a baking tray. Beat the egg whites to stiff peaks using an electric beater. Add the cream of tartar. Add one tablespoon of sugar at a time and beat until the sugar is dissolved in the egg whites. It’s worth taking your time to mix it in properly; I think that’s where I have slipped up in the past. Beat in the vanilla extract. Your egg whites should now be glossy and stiff. Spoon some of the mixture onto the baking paper and spread it out in the shape of the circle using a spatula. Do this repeatedly until all the mixture is on the baking paper. Try and get some height as it looks better and it collapses a little when cooked. Also, put a dip in the middle as this will be for your topping. Bake in the oven for 10 minutes. Reduce the oven temperature to 110 degrees Celsius or 90 degrees fan forced. Cook for a further hour and 20 mins. The meringue should be crisp and dry. Turn off the oven and leave the meringue in the oven overnight. Scoop out the passion fruit pulp from the fruit into a bowl. In a separate bowl add the cream and sieve in the icing sugar. Stir in half of the passion fruit pulp. Spread the cream mixture over the meringue base. Sprinkle over the remaining passion fruit pulp and scatter over the fruit. My friend and I are big foodies. We often head over to our local department store and flick through all the wondrous cookbooks. I came across Neil Perry’s Spice Temple with all it’s Chinese style culinary delights. Needless to say I came home with the cookbook. I have bookmarked all the recipes that I like. I shouldn’t have bothered as it’s pretty much the whole cookbook. This is the first recipe that I tried and based on this, I can’t wait to experiment with the rest. A couple of things about this recipe, it takes a long time if you are starting from scratch. You will need to make the stock and the braised beef and the noodles separately. It’s well worth the effort, I must say. The second thing is that the original recipe calls for beef brisket. I could find any in my local supermarkets so upon researching, I found that chuck beef will work just as well. I have used it in shredded chilli beef before and was happy with that. You will need a pasta making machine if you want to give the noodles a shot. My taste taster went back for 3 helpings, I think that speaks for itself. Enjoy! The aromas in my kitchen from this stock were amazing. I froze my leftover stock to use at a later point in time. Place all the ingredients in a large saucepan. Bring to the boil and then reduce to a simmer for 30 minutes. Easy peasy. Mix all the ingredients except the oil in a bowl and combine with a spoon or your hand until it comes together. Remove from the bowl onto a dusted surface and knead for 10 minutes if your arms can last that long. Cover with cling film and chill in the fridge for 30 minutes. Remove from the fridge and repeat the process. Cut up the dough into 4 pieces and flatten one. Feed through the pasta machine at a thick setting (2 on mine) and work your way up to a thinner setting (6 on mine) approximately 5-6 times in total. Each time dust it with some flour and fold. Once it’s thin, cut into 3 cm in thickness and set aside. you can just use a standard knife if you don’t have a pasta cutter. Place the noodles over a rolling pin and repeat the process with the remainder of the dough. I made this in the slow cooker. The braised beef recipe states 1kg beef but you only use 100g for the main dish. Cut the chuck steak up into large chunks or if you are using the brisket you can leave it whole. You can take some of the excess fat off but not too much. It makes it nice and juicy when slow cooked. Brown the meat in a pan in batches. Add to the slow cooker with the master stock, season with salt and pepper. I left it cooking on auto in the slow cooker for about 8 hours. Fish out the beef from the stock and place it in a separate bowl and pull it apart with two forks. If you don’t have a slow cooker, place the stock in an ovenproof saucepan or casserole dish and bring to the boil. Add the beef to the stock and cook in the oven for 3 hours at 170 degrees Celsius or until falling apart. Heat the peanut oil in a wok. Add the peppercorns and chilli and stir-fry for a couple of minutes. Add the garlic, ginger, both pastes and fry for another couple of minutes. Add the liquid ingredients to the pan and reduce. Stir in the shredded beef and reduce the heat. Bring a large saucepan of salted water to the boil. Add in the noodles. They should only take about 2 minutes. REALLY, I thought no way they won’t cook in 2 minutes but mine were slightly overdone because I left them on longer. Drain the noodles but hold back a little of the cooking liquid (approx. 2 tbsp.). Stir in the oil to stop them sticking together. Then add the noodles to the sauce and beef and coat the noodles well. Drizzle over some chilli oil and sprinkle over the spring onions. 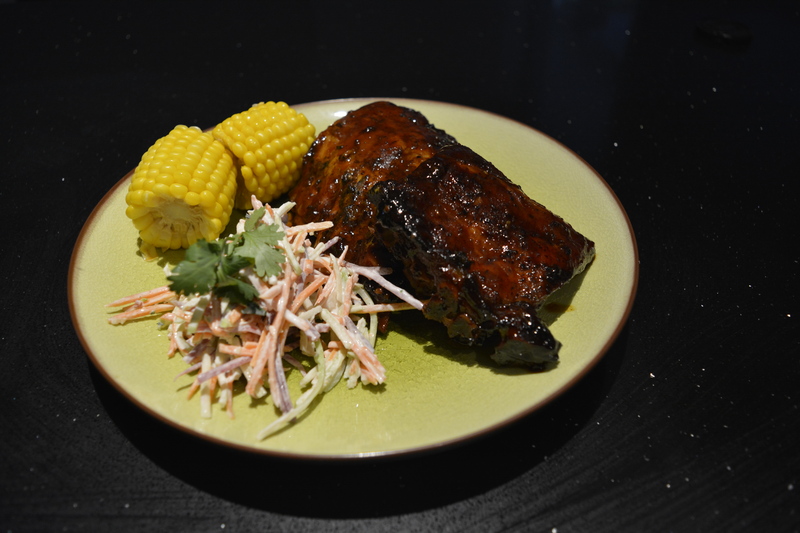 I think ribs need to be slow cooked, otherwise they can be tough and chewy. These are delishussly succulent. I saw this recipe posted on Facebook and thought that I so needed to try it. I made it for Valentine’s Day along with the Chocolate Olive Oil Cake. The way to a man’s heart, well let’s face it anyone’s heart. This is a set and forget recipe, so so easy. In a bowl mix all the sauce ingredients together. Place one rack of ribs in the slow cooker and pour over half the sauce. Get your hands in there and cover the ribs with the sauce. Place the second rack on top and do the same as point 3. Cook on high for 4 hours or 7-8 hours on slow/auto. Serve with coleslaw and some corn on the cob.